The Borgias ran on Showtime from 2011-13, and while it wasn’t always perfect, DAMN if they didn’t do an amazing job with the visuals. Set in the 1490s, the show centers around Pope Alexander VI, his three adult children (Cesare, Lucrezia, and Juan), and his mistresses (Vanozza and Giulia). We podcasted about the first three episodes way back when, and compared it to its competition later in the series. And while I sometimes laughed at Juan’s mullets, thought Cesare was un-hot (sorry! Something about his rabbit upper lip), and felt that the plot was a little heavy-handed, I ALWAYS adored the costume design and, in particular, the women’s hair. 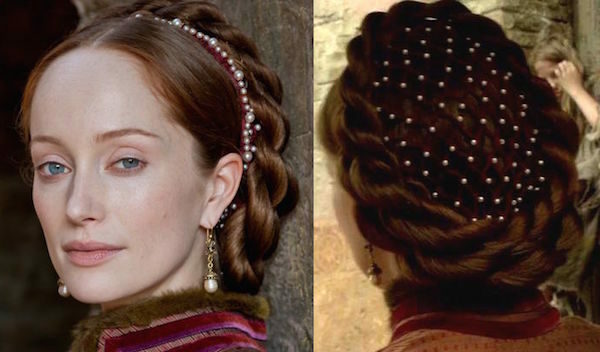 I’ve come back to images from the show repeatedly for ideas for 15th/16th century hairstyles, and thus was inspired to share my Borgias hair lust with y’all. Now, I can get a little OCD about this kind of thing, so I thought I’d better split things up into the three seasons (although I am having a hard time finding screencaps for season 3 — anyone have a source?). 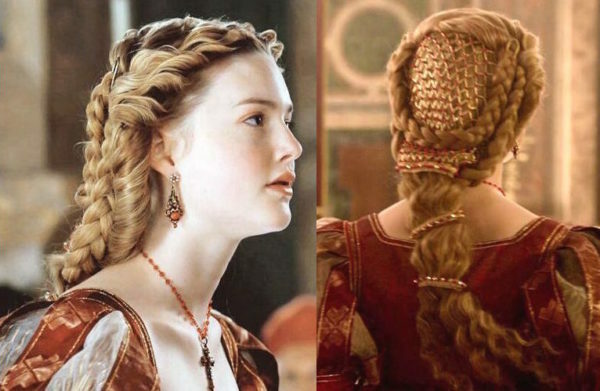 If you’d like more background on the series and the hair design, check out our post on season 1, where you’ll also find more historical research. 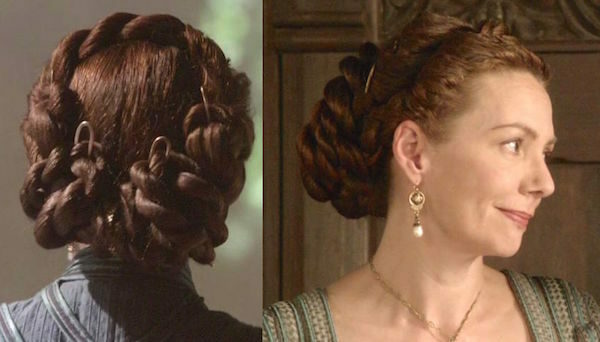 Now I want to move on to the main female characters in season 2, and compare their hair to historical sources of the period. 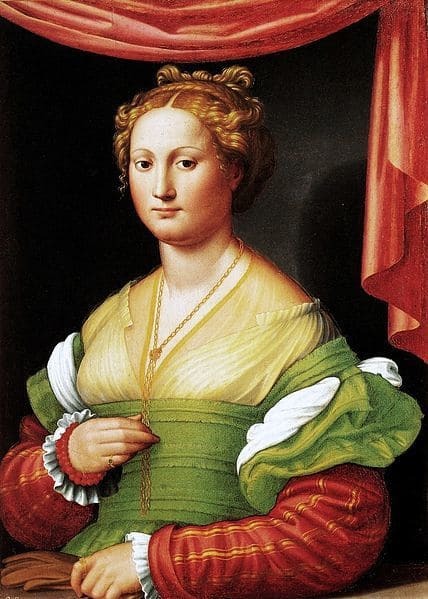 As I said about the first season: if there’s one thing I’ve learned from studying Italian fashion of the 16th century, it’s that there’s tons of variation depending on what city/city-state you’re in, and I’m guessing that holds true for the late 15th century as well. I’m not going to get all “here’s what was worn in Rome, here’s what was worn in Milan” because I’ve got a life to live, but do note that the historical images I’m pulling are those that seem similar and you may know more than me (if so, weigh in!). This time around, I also want to compare the hairstyles to real images of these real historical figures… the problem being, most of the historical imagery is “POSSIBLY” a portrait of X. So, we don’t have that much to go on. I do think there must have been a change in hair designer going into season 2, or the hair designer wanted to shake things up, because you get an almost totally new look that’s consistent across all the main characters. 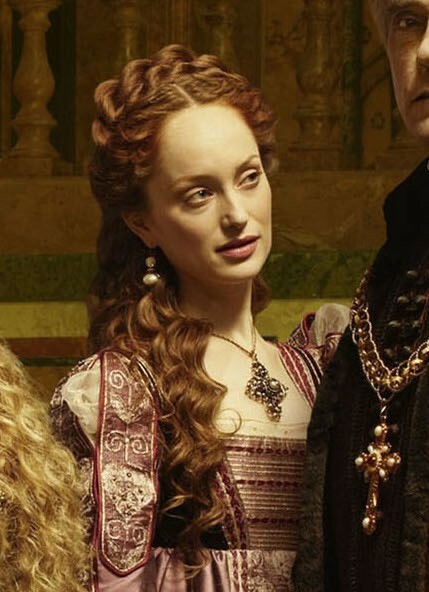 Lucrezia gets my platonic ideal of Renaissance hair in season 2. 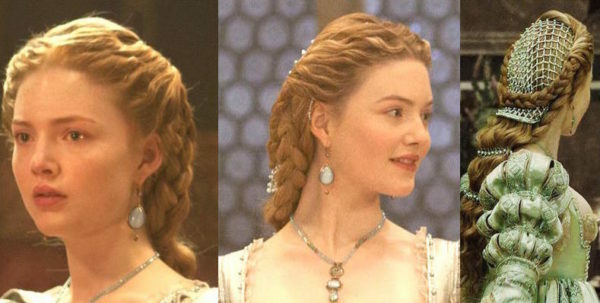 Tons of braids, tons of wave, a little bit of hair down to soften the look (yes, not historically accurate but soooo pretty)… GAH. LOVE. At the masquerade ball, Lucrezia has what will be a pretty typical style for her this season, but with the addition of a floating pearl tiara. Which seems pretty modern bridal, although it’s pretty. 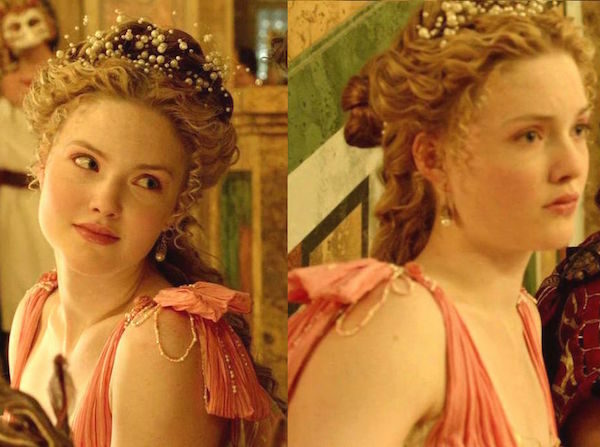 Was Lucrezia Borgia this blonde (not that it really matters)? I don’t know. There are two images that are supposed to maybe be her that show her as a really light blonde. 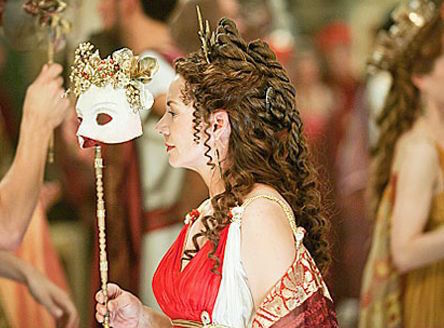 Both, however, are allegorical, so the hairstyles shown should be compared to the above masquerade style and not the below everyday styles. 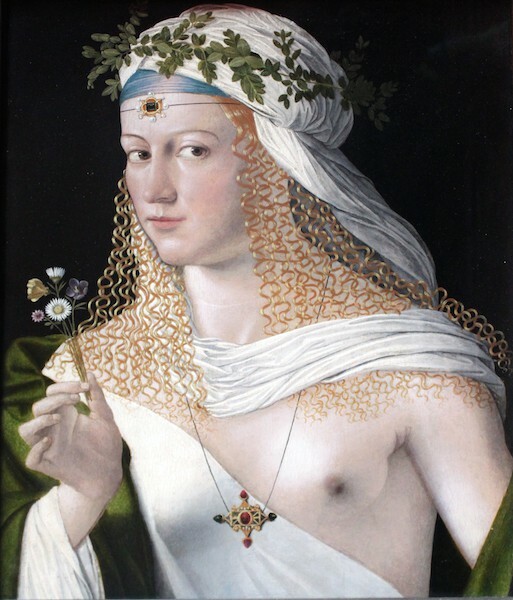 Bartolomeo Veneto, “Idealized Portrait of a Courtesan as Flora,” traditionally thought to be Lucrezia, 1520, Städel. 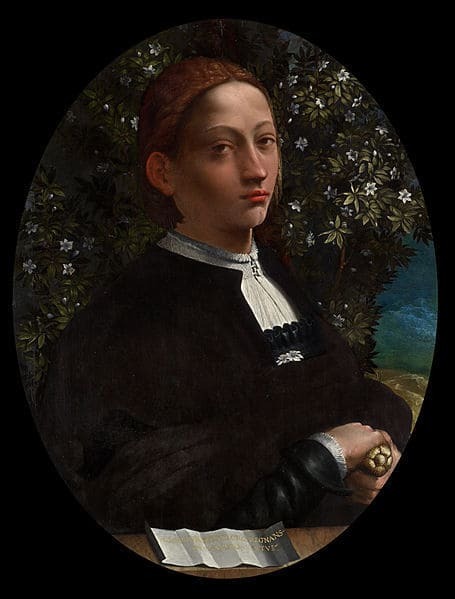 Attributed to Dosso Dossi, Battista Dossi, “Lucrezia Borgia, Duchess of Ferrara,” (1519-1530), National Gallery of Victoria, Melbourne. Really truly her, according to the museum site. 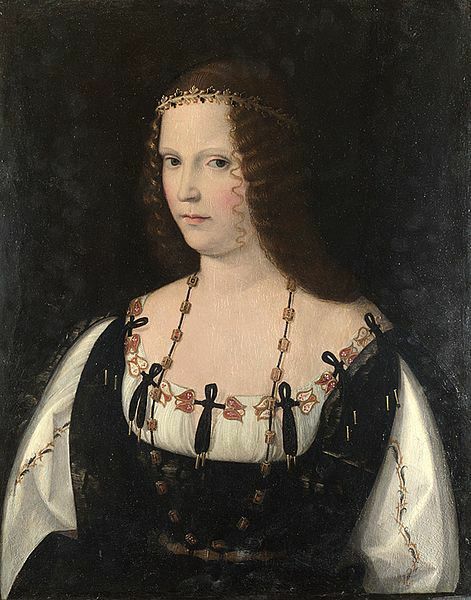 Bartolomeo Veneto, “Portrait of a Woman (presumed portrait of Lucrezia Borgia),” National Gallery (UK). LOVE THIS SO HARD. She’s got a double braid looped up, with the front rolled back. Notice how they’ve used a hairnet (look at the right-most pic) to keep her hair tidy. Here’s that double braid again, but with lots of hair hanging down from underneath. 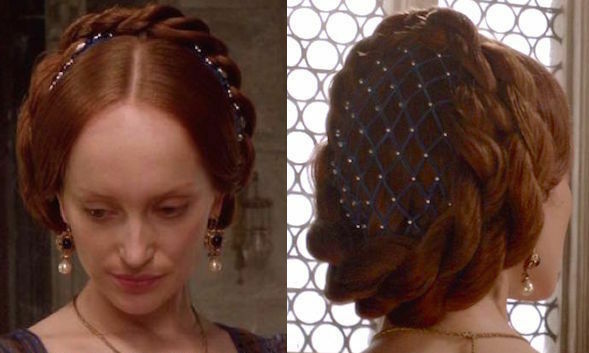 Here they’re doing the beaded net, but now it’s more of a Juliet cap that’s worked into the hair than the net-over-the-style seen in season 2. All the pearls really make this style pop. Again with the beaded net cap thingie. 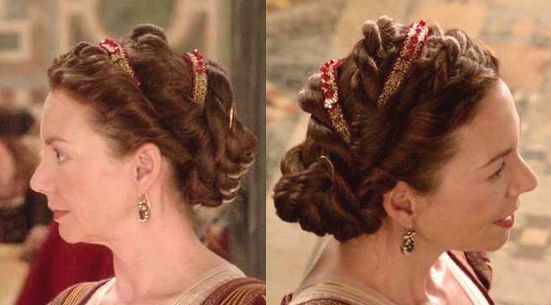 So the hairdresses clearly LOVED these big honkin’ gold hairpins (look at the left-most image). Anyone know how period that is? I love how this style incorporates both a regular AND fishtail braid, plus the hair-down portion is clipped. Again with the big honkin’ gold hairpins. Beaded net cap, two kinds of braids, clipped hair, PLUS hair down! Looks like they’ve twisted her hair around a separate twist in order to get that volume. ooo, here there’s a twist around the beaded caul, and then a braid around that! And an all-up style, with the front hair twisted around a braid. Love. This. So. Hard. It’s the bling, I think. Going much simpler, with the front hair twisted and wrapped over a bun, which is covered by another caul… plus one more twist across the top of the head. 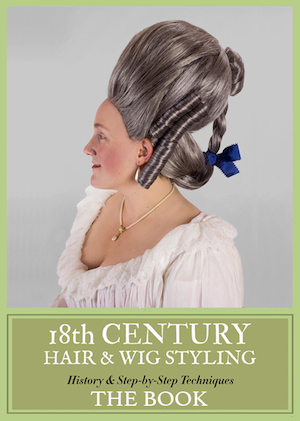 This wedding hair combines all the perfect Lucrezia hair elements. Bartolomeo Veneto, “Portrait of a Woman (presumed portrait of Lucrezia Borgia),” National Gallery (UK). Image lightened to better see the hairstyle. 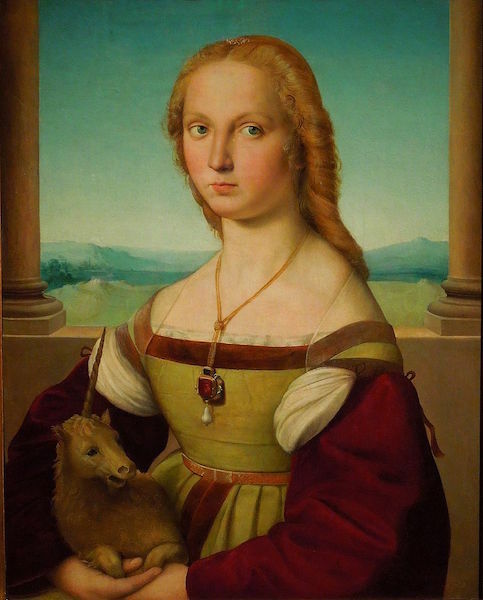 Attributed to Dosso Dossi, Battista Dossi, ” Lucrezia Borgia, Duchess of Ferrara,” (1519-1530), National Gallery of Victoria, Melbourne. Image lightened to better see the hairstyle. Still loving Giulia, because Team Redhead. 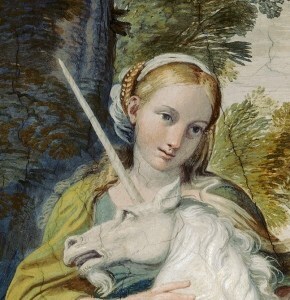 Raphael, “Portrait of a Lady with a Unicorn” (supposedly Giulia), c. 1505, Galleria Borghese. 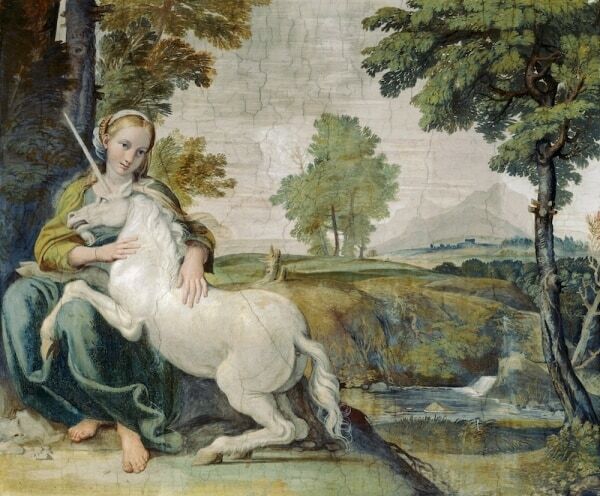 Luca Longhi, “The Lady and the Unicorn” (possibly Giulia Farnese), Castel Sant’Angelo. 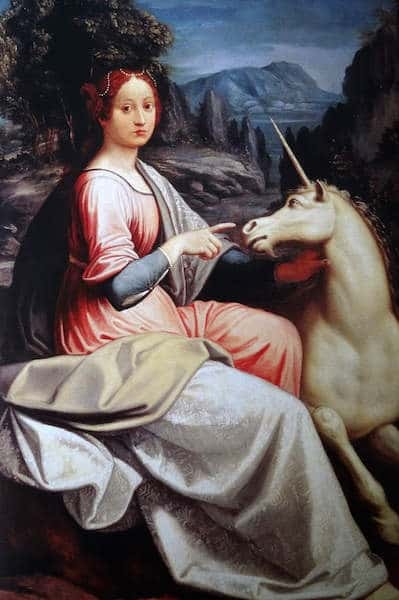 Domenicho, “Virgin and Unicorn (A Virgin with a Unicorn)” (depicting Giulia Farnese), c. 1602, Palazzo Farnese. 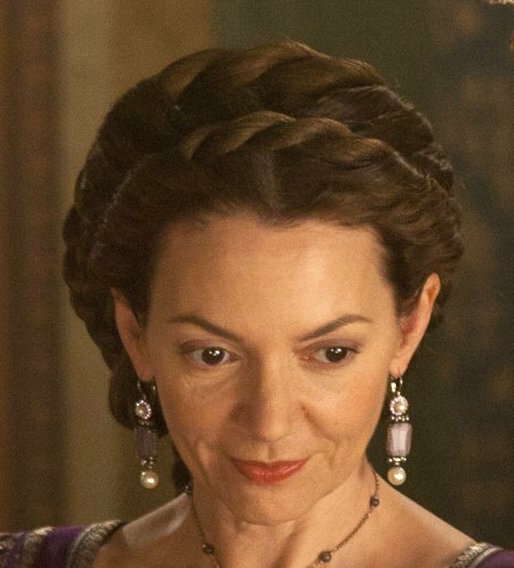 Giulia’s hair in season 2 is in some ways very similar to Lucrezia’s; on the other hand, she does more twists than braids (I think as a character differentiation), and also starts wearing her hair all-up (I think to make her look more mature; at least, that’s how I read it). Masquerade hair. 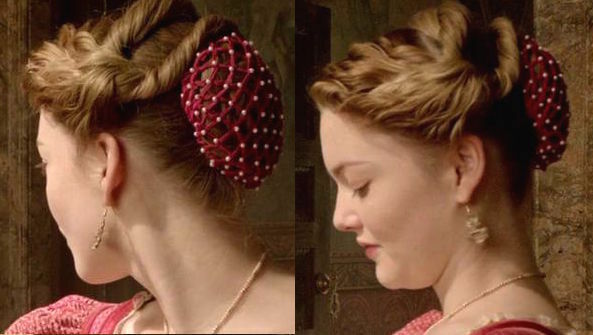 Similar to Lucrezia’s, but with twists in addition to braids. Thankfully, someone decided Vanozza gets to be glam this season 2… which is weird, because she’s been firmly dumped by the Pope. But, I think it does help you understand (in part) that he is still attracted to her. Innocenzo di Pietro Francucci da Imola, “Portrait of a Woman (possibly Vannozza Cattanei),” Galleria Borghese. Yet another faaaabulous masquerade do. Note the twists — I think it sets her up in this scene as dueling with Giulia. What makes Vanozza more glam? It’s bigger, more complicated hair. Seriously, Vanozza’s hair is more interesting than Giulia’s this season. SO MUCH HAIR, even ringlets! Here she’s got twists that merge into two buns. More of those ginormous hairpins. 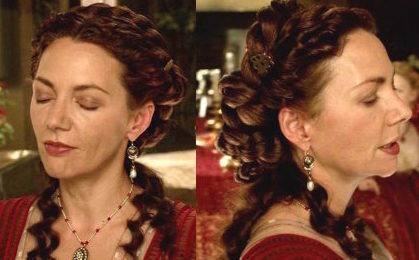 Caterina also gets to get more exciting hair in the same styles as Lucrezia and Giulia. She’s sexier now, because she’s got more hair down. This is from when she’s gettin’-it-on with Cesare. Kind of a throwback to all the beaded nets in season 1. 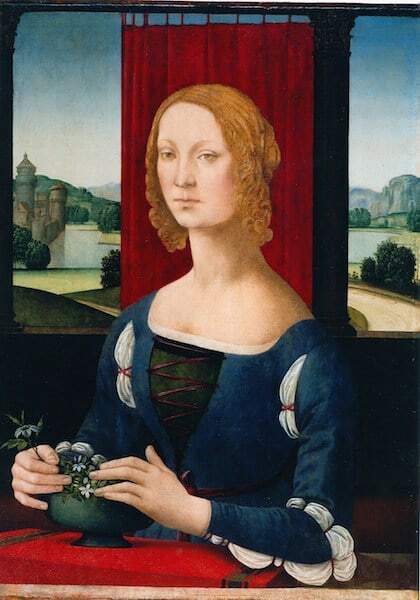 Lorenzo di Credi, “Portrait of Caterina Sforza,” Pinacoteca Civica di Forlì. No historical sources to compare here, just, enjoy the pretty! Who, I recently realized, is the same actress who played the awkward daughter of Kirstin Scott Thomas’s character in Gosford Park. Random! I’m still looking for screencaps from season 3, ping me if you’ve got a source! 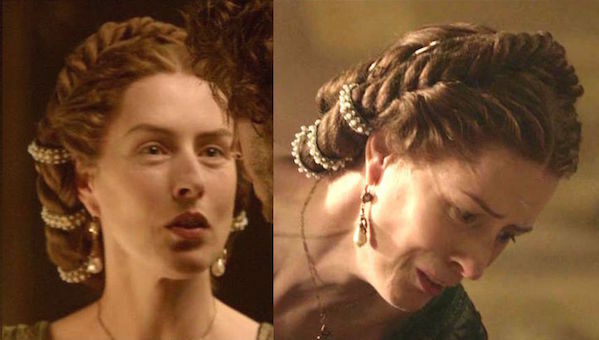 What do you think of the different hairstyles in season 2 of The Borgias? You just need fake hair!! Wouldn’t they have sewn their hairstyles then? 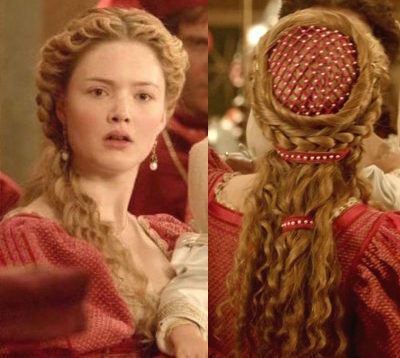 I am over the moon on the hair of Lucrezia, Giulia and Catarina Sforza. 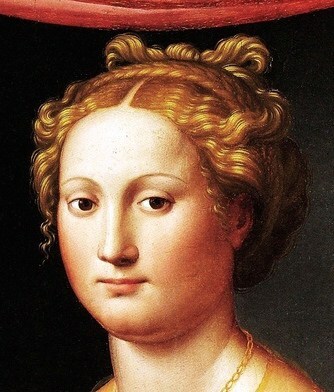 Lucrezia looks to be a strawberry blonde in the Dossi portrait. 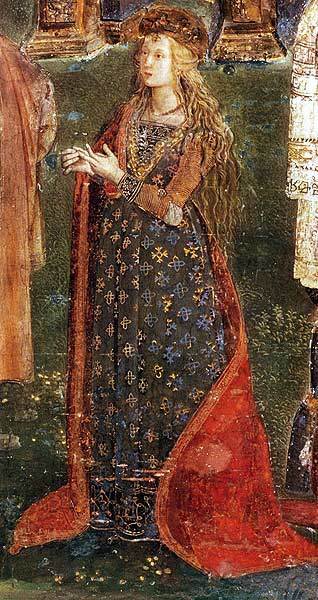 And it has to be dated from 1505 and after as Lucrezia didn’t become Ferrara’s duchess until 1505. She died in 1518. So can we consider her a redhead? 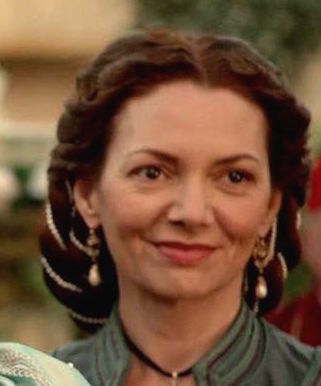 I have no idea if any of it is historically accurate, but I do know that Holliday Granger has never looked more gorgeous than she does on this show! 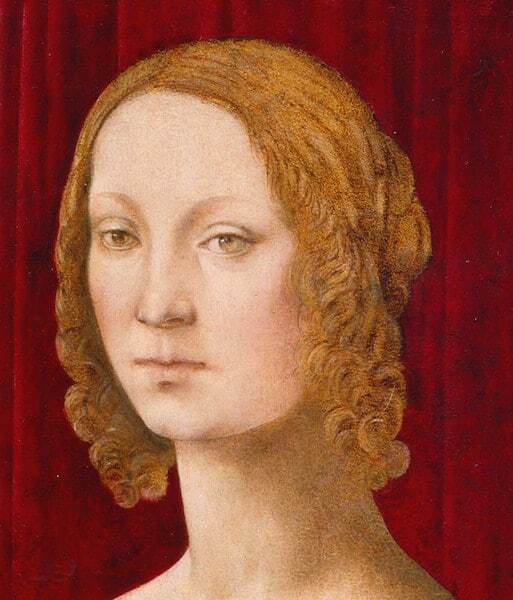 If you want Caterina Sforza depicted with hair like in her portraits, check out Assassin’s Creed 2 game! 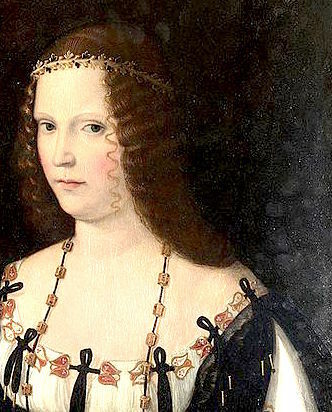 Pretty sure that hair bleach was a thing in 16th century Italy, which might account for the variation/lack of agreement on Lucrezia’s hair color. Not so sure about late 15th, but within the realm of possibility. Not to mention that it isn’t at all unusual for hair to get darker after a pregnancy (and sometimes to get darker after each kid) and she had a lot of pregnancies. Yes! 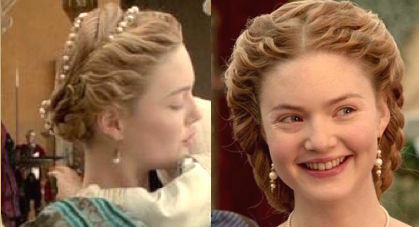 You’ve also got the real historical example of Catherine of Valois, who wore blonde wigs despite having dark brown hair. For what its worth, I don’t think the Princess Leia buns are allegorical. 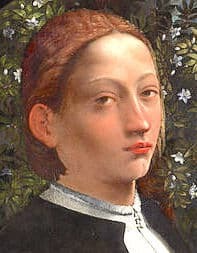 The same style shows up in the semi-famous portrait of Battista Sforza, and there isn’t anything about that one to make me think its anything other than a straight up portrait. 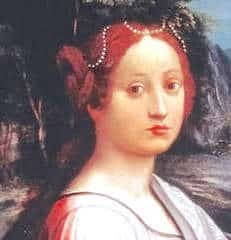 Apparently Giulia Farnese was a mediterranean beauty, with black eyes, dark hair and tanned skin. Her beauty was legendary though, even if she wasn’t in line with the aesthetic canon of those times. 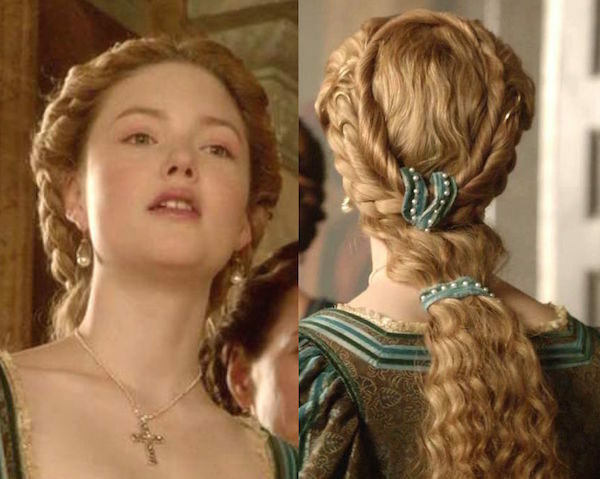 I loved the ladies hair in the Borgias. 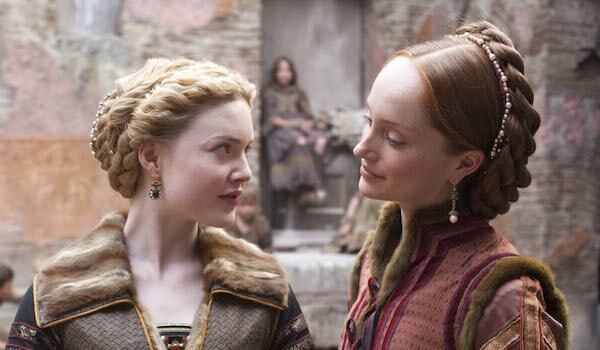 Supposedly Lucrezia’s hair was very fair. There is a lock of it displayed at the Pinacoteca Ambrosiana in Piazza Pio XI in Milan. It was also seen by Lord Byron who described it as very fair. It looks very gold in colour to my eyes. Almost a strawberry blonde. 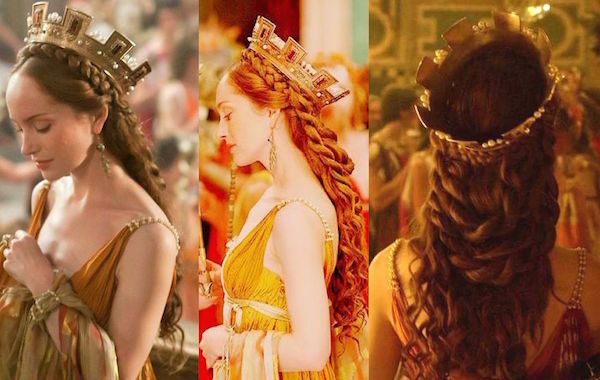 Those gold hair pins are historically accurate! They are based on finds from Finsbury Circus dated to the 14th century.